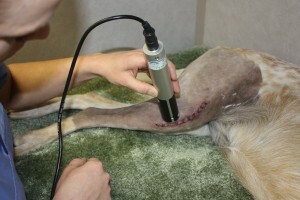 A recent study conducted by the University of Florida found that using a therapeutic laser on dogs suffering from paralysis, caused by Intervertebral disc disease, helps them recover more rapidly from surgery when compared to dogs not treated with a laser. Researchers used a class 3B laser (hey that’s what we use at the clinic) to treat 17 post-op dogs in a year-long study, and compared the results to 17 control dogs. “We found that dogs receiving laser therapy were walking a full week before the patients that didn’t receive the treatments,” reported Dr. Tom Shubert, who is a professor of small animal neurology at UF’s College of Veterinary Medicine. As one of the modalities that we use in our rehabilitation practice (Ft Worth Animal Rehabilitation), laser therapy has proven to be very successful in treating inflammatory and painful problems. Just days after my last post about Buddy and his pal Scarlett, Buddy’s owners noticed that he couldn’t see. They called me, late, a few evenings ago, and we decided that he had to visit the eye doctor asap. The next morning, Buddy was in surgery to have his detached retina repaired with laser surgery. 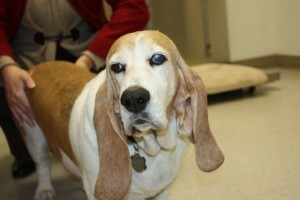 He is back home and, for now, our specialist feels that Buddy should regain his eyesight. Go Buddy.